The cockpit voice recorder of the Boeing 737-800 was found late Sunday but the hunt continued for the "black box" that records all flight data and could hold the answer to the disaster. Only eight people among the 166 passengers and crew on the flight from Dubai to the southwest port city of Mangalore survived the crash on Saturday morning after the plane veered off the end of the runway and burst into flames. 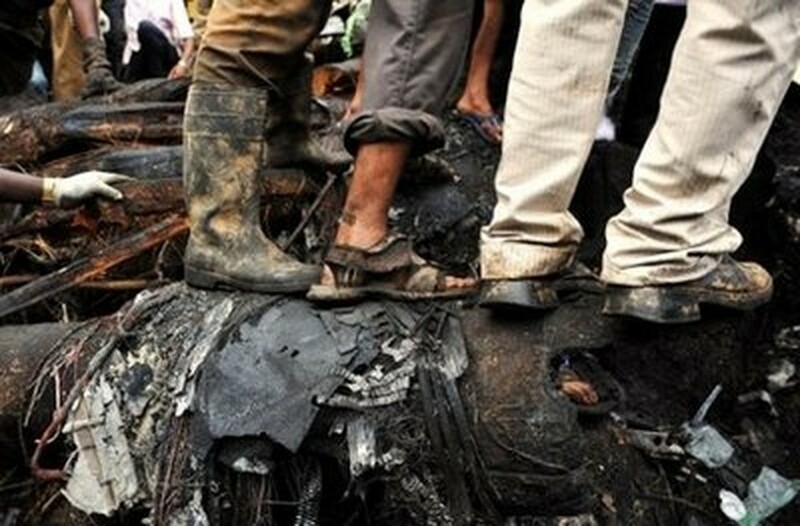 Rescue personnel and volunteers walk amid the wreckage of the crashed Air India Boeing 737-800 in Mangalore on May 22. Survivors told how they escaped as the fuselage broke into pieces and the cabin filled with thick smoke. All 158 bodies have been recovered but DNA tests are being conducted to determine the identities of 12 passengers. At a news conference in New Delhi on Monday, Prime Minister Manmohan Singh expressed his "deep condolences" to the families of those who died and held a one-minute silence. Air crash investigators from India's Directorate General of Civil Aviation (DGCA) have inspected the airport runway and are studying tapes of air traffic control contact with the plane in its final moments. The DGCA said in a statement that the cockpit voice recorder (CVR) "is expected to yield the desired information" even though it has been affected by fire. The digital flight data acquisition unit, which is similar to the "black box" digital flight data recorder but stores information over a shorter period of time, has also been recovered, it added. "Analysis of CVR and flight data will take about a fortnight," the statement said. Aircraft manufacturer Boeing said it was sending a team to help the investigation. The area around the crash site remained cordoned off, with investigators using excavators and cutting equipment to sift through the charred remains of the fuselage, an AFP photographer at the scene said. Survivors of India's worst air crash since nearly 350 people were killed when two planes collided in mid-air over New Delhi in 1996 described hearing a loud thud shortly after touchdown at the hill-top Bajpe airport. Landing conditions were fair with good visibility, officials said, and there had been no distress call from the cockpit. Civil Aviation Minister Praful Patel described the chief pilot, a British national of Serbian origin, as a "very experienced" flier who had logged 10,000 hours of flying time. Patel told reporters on Saturday it was too early to determine the exact cause of the crash but he said that the sanded safety area surrounding the runway in the event of an overshoot was shorter than at some airports. Air India Express is a budget airline operated as a subsidiary by the state-run carrier. Many of the passengers were migrant workers returning from jobs in the Gulf to visit their families. India's last major plane crash was in 2000, when 61 people were killed after a passenger jet plunged into a residential area near the eastern city of Patna. The country's air safety record has been good in recent years despite the rapid increase in airlines keen to serve increasingly wealthy domestic customers. Saturday's disaster came as Air India is struggling to turn round its finances after posting a net loss of more than one billion dollars last year.